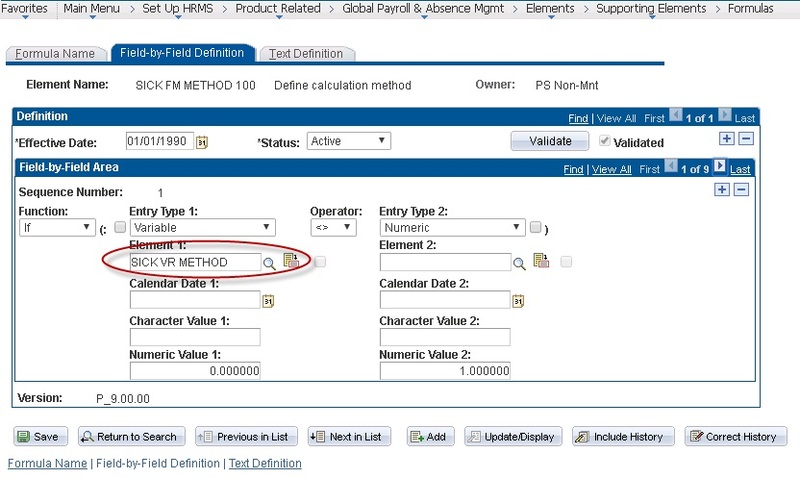 As you can see on the Calculation page, the Absence Entitlement uses a Formula called SICK FM METHOD 100. 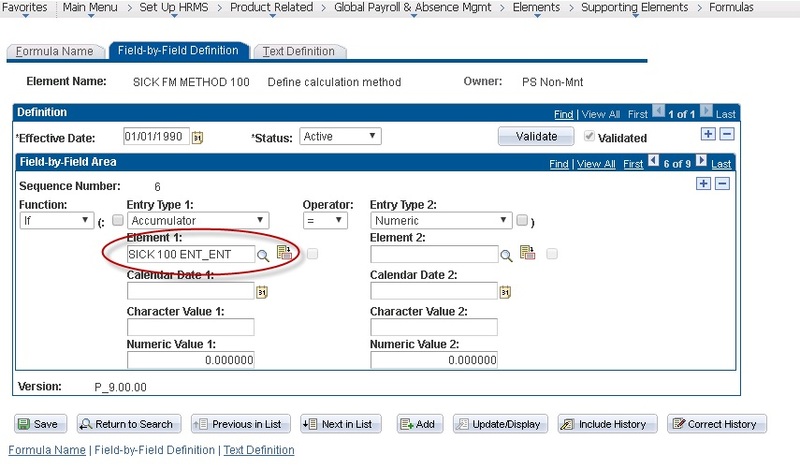 Here are 2 screen shots of this element showing the two elements (circled in red) that it uses. As you can see on the Field-by-Field Definition page for this formula, the first sequence number uses a Variable element called SICK VR METHOD and the sixth sequence number uses an Accumulator element called SICK 100 ENT_ENT. 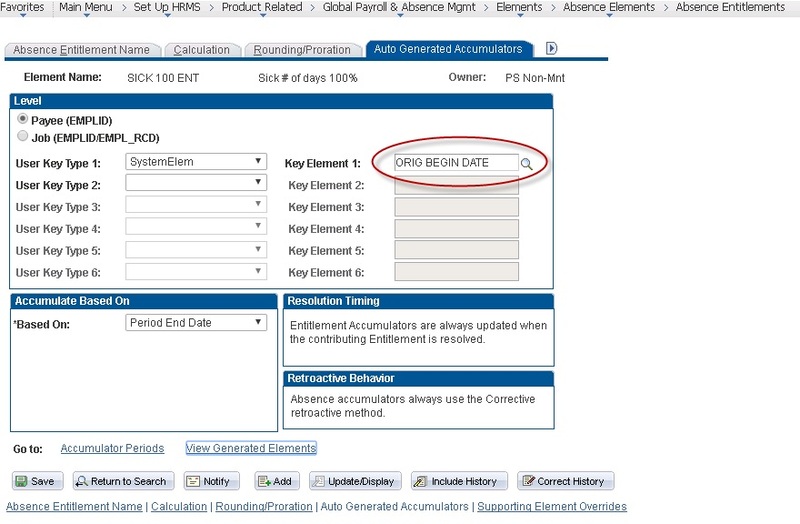 Purpose - To return a hierarchical view of a Global Payroll/Absence Management Element's children or parents. there would NOT be a level, such as 999. All of the elements listed at Level 2 include all of the items I circled in the screen shots above for the Absence Entitlement element. And near the end of the results you can see under - - [Formula] SICK FM METHOD 100 ALL - 1259 at Level 3 are the 2 elements I circled in the screen shots above for the SICK FM METHOD 100 element. 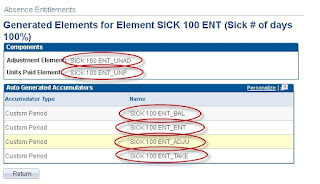 And one of those (the SICK 100 ENT_ENT Accumulator) goes down one more level to show the Elements that accumulator uses. 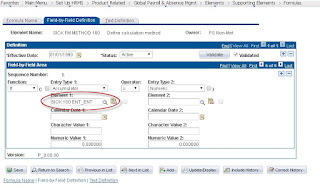 The SQL is written for Oracle databases only using Oracle's hierarchical query syntax (STARTS WITH ... CONNECT BY ...) It also makes use of Oracle substitution variables. 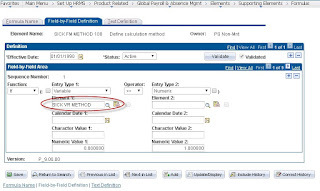 It can be run for any element type in Global Payroll or Absence Management. It can limit the number of levels returned. Some elements might go 10 or 15 elements deep. In those cases it might be simpler to limit the number of levels to 4 or 5 levels, depending on what you are looking for. It can switch the “direction” to search. Instead of going down it also can go up. In this case I found it easier to limit the number of levels. In most cases the SQL will return all child elements. But in other cases it won’t. In our example above, the elements included under the Accumulators are listed, but it doesn’t go any further down for those items. These are items from the Members page of the Accumulators component. 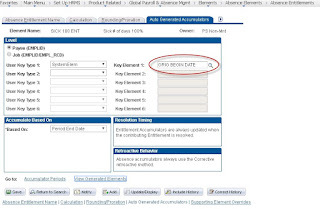 If the elements were included via the Accumulator's Definition or Level pages, then those would get returned AND they would continue down into deeper and deeper levels. That's a great looking bit of SQL - I will keep it in mind for when we next have to look at our absence management elements. Thanks Pete. Just keep in mind you'll have to modify it for SQL Server. Just do a Google Search for "sql server hierarchy query" and it should give you some ideas on how to modify this sql so it will work for you.